The Huskers (19-8, 10-4 Big Ten) suffered their first road loss of the season Saturday with an 83-75 defeat at the hands of Indiana (15-12, 8-6 Big Ten), dropping them to a game behind Ohio State and two games behind Maryland in the loss column in the Big Ten standings. It was a bad combination in the first half: Nebraska couldn’t make its shots and it couldn’t keep Indiana from scoring points. The Huskers, a perfect 9-0 on the road entering the affair, shot 37 percent in the first quarter and then an even worse 28 percent in the second quarter. On the other side, IU couldn’t miss. More specifically, Hoosier guard Tyra Buss couldn’t miss. She had 21 at the halftime break and the Huskers looked hard-pressed to slow her. Nebraska shot it better from the floor in the second half (45 percent) but Indiana just had too much scoring. The Huskers cut what was an eight-point fourth-quarter IU lead to one with just under four minutes to play before Indiana responded with a quick 8-3 scoring spurt punctuated by a back-breaking three with 1:35 left. Buss finished with 37 points, the most any single player has scored against the Huskers all season. Two other Hoosiers topped double-digits, including another 21 points from guard Jaelynn Penn. As a team, IU shot 46 percent from the field while Nebraska sputtered at 38 percent. Nebraska had a significant depth advantage over Indiana, but it didn’t really matter with Buss scorching the nets like she was. Big Red got 12 points from guard Janay Morton off the bench to lead the way offensively. Guard Nicea Eliely had 12 as well. Center Kate Cain added 10 points and nine boards. Guard Hannah Whitish struggled once again to score; she finished with 11 points but took 11 shots to get there. In her last five games, Whitish has connected on just 14 of her 45 looks (31 percent). 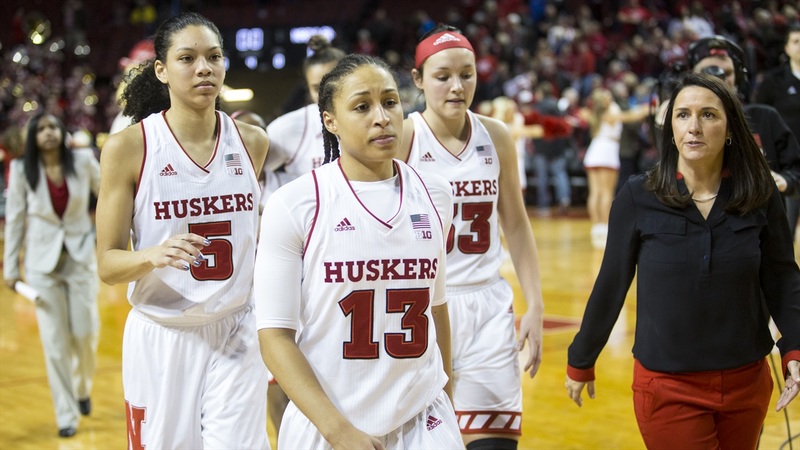 The Huskers will look to regroup on Thursday against Penn State at home before closing out the season on the road against Maryland on Sunday, Feb. 25.